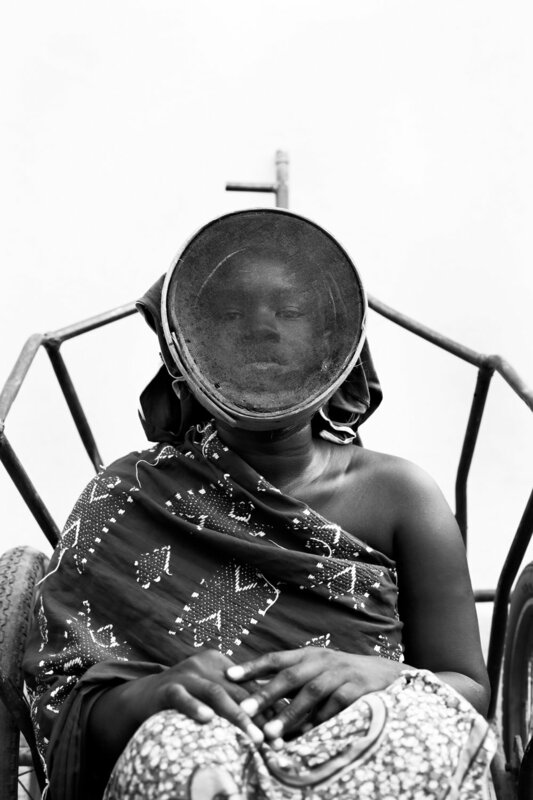 Malian artist Fatoumata Diabaté follows in the footsteps of her country’s revered canon of twentieth-century photographers, with her black-and-white portraiture and itinerant studio project, Studio Photo de al Rue. Born in Bamako, Diabaté trained at Centre de Formation Audiovisuel Promo-Femmes and her work was first recognised at Rencontres de Bamako 2005, where she won the Afrique en Créations prize. Since then her clients have included Rolex, Oxfam and World Press Photo, and she has exhibited at Addis Photo Fest, Biennale Internationale de l’Art Contemporain de Casablanca, and Les Rencontres d'Arles. At Labs Diabaté presents two projects, L'homme en Animal and L'homme en Objet. Photography came into my life when I decided to end my high-school studies in 2001 because of daily strikes, which weren’t helping me move forward. I had another ambition, namely to become self sufficient so that I could support my mother. I told everyone I met I needed a job. They asked me what kind of job I needed and I would say it didn’t matter because, as the Malian saying goes, “Bara lan golo tee maa lan golo de be” (“There’s no stupid job for me but there are stupid people”). Then I heard of a school educating women in photography, which at that time was a man’s vocation, so I enrolled. I found my voice as a photographer quite easily as I was very determined and passionate from the beginning. What is the concept behind Studio Photo de al Rue? My parents were both immortalised in a portrait by Seydou Keïta, who was our neighbour when I was growing up. So I created this travelling street installation to pay tribute to the great masters of African studio photography (Seydou Keïta, Malick Sidibé, Samuel Fosso, Oumar Ly), whose work I have always admired, and to keep this tradition alive. It's also about reviving the technique to give different audiences the opportunity to have the shoot experience and the joy of being left with a beautiful memory for life. That is why I take Studio Photo de al Rue to different events around the world. What inspired L'homme en Animal and L'homme en Objet? These works relate to Mali’s oral culture, which it has had since ancient times. Telling tales is part of our tradition. When I was growing up, each evening we would meet around a wood fire and its flames were so poetic – thanks to the moral lessons we learned at the end of each tale. These stories have followed me throughout my life. The use of handmade mask objects and costumes in her work relates to the sacred dimensions of African masks and how, in most of these tales, humans, animals and objects are interconnected and possess invisible powers. All works are available from Red Hook Labs and Artsy and sales support the artists in their work.